Ellenburg Photography is the proud portrait Sponsor for the Daddy Daughter Dance. This weekend local South Alabama Dads will be celebrating Daddy's Girl with a dance completely devoted to every girls first love, her Dad. There is nothing better than helping your baby girl pick out the perfect dress for her big date with Dad. Daphne's daughter, Madison, discovered this exciting adventure last year. It was so much fun to hear about the planning - there was going to be flowers and dinner and dancing and SHOPPING! Oh, my. Everything a girl could want. 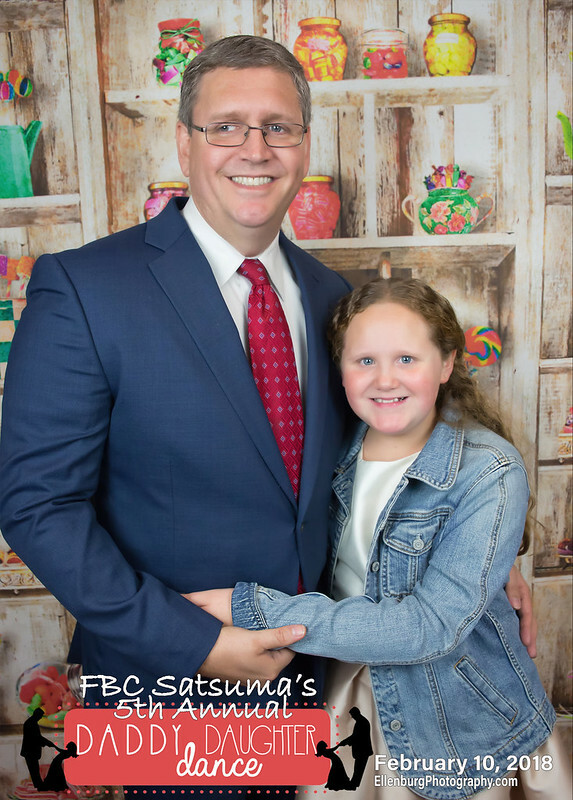 First Baptist Church of Satsuma puts on a first class Daddy Daughter Dance every year held at the local High School here in Satsuma Alabama. Every ticket purchased sponsors the mission trip they take that year. The dance has snacks and music and so much red and pink everywhere that it looks like Cupid himself helps with the decorations. Ellenburg Photography is the proud portrait sponsor for this event. Daphne Ellenburg donates her time and talent to events that matter the most to her values - and Family and Children are always at the top of that list. Ellenburg Photography will be Photographing this year's Dads and Daughters from 4:30pm - 8 pm. For every ticket purchased, Ellenburg Photography will donate a 5x7 portrait to each family. And if you want more - Ellenburg Photography will be offering heavily discounted portrait packages. This is a special time for young girls. They are learning self value and enhancing the bonds of that special Daddy's girl love. They are learning how they should be treated on a date and how Daddy will always put them first. They learn to love to from Dad. This night is special and we are happy to donate our time to this wonderful event. Enjoy a peek at last Year's Dance. For More Information and Tickets, Call 251.675.1280. It's not too late to plan to attend this Year's Daddy Daughter Dance. Advance Tickets are $20 and are being sold at REL, SHS and FBC of Satsuma. Tickets at the door are $25, and you can add a guest or additional daughter for only $5. Dress up and come out with your baby girl. All her friends will be there and you can watch them spin and twirl and giggle. There will be so much giggling. Don't miss the fun. And stop by and see Daphne Ellenburg for your portraits at the event. Got Questions? Reach out to Daphne.